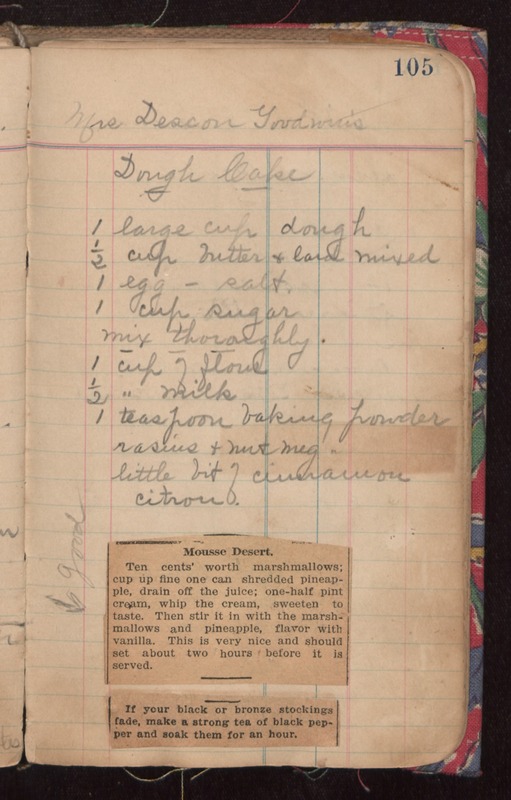 Mrs Deacon Goodwin's Dough Cake 1 large cup dough 1/2 cup butter & lard mixed 1 egg - salt, 1 cup sugar mix thoroughly. 1 cup of flour 1/2 " milk 1 teaspoon baking powder rasins & nut meg little bit of cinnamon citron. Mousse Desert. Ten cents' worth marshmallows; cup up fine one can shredded pineapple, drain off the juice; one-half pint cream, whip the cream, sweeten to taste. Then stir it in with the marshmallows and pineapple, flavor with vanilla. This is very nice and should set about two hours before it is served. good If your black or bronze stockings fade, make a strong tea of black pepper and soak them for an hour.